I am saying (with my fingers crossed) that the writing part of the book is almost wrapped up! I have added so much more material, however, that I want a quick copy edit again, before moving on to book design, publishing and promotion. Hopefully, Growing Up with G.I. Joe’s is about 6 months out from being in stores, and I am saying that also with my fingers crossed! FYI, I am now polishing a chapter on merchandise that was sold at G.I. Joe’s over the years, with a lot of help from my brother, David. For instance, can you believe that foam rubber and upholstery fabric offered for sale in the late 1960s? That happened in Store 3 at the North Portland location. 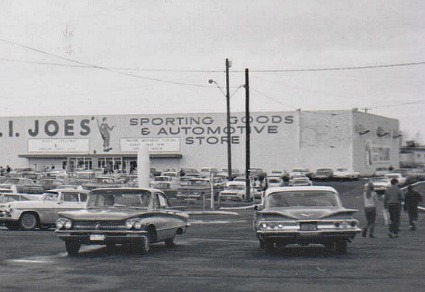 The photo is of Store 2 in the same time period, and is from the David Orkney Collection.